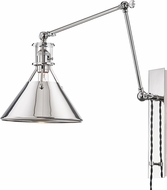 For those special evenings at home snuggled in bed while reading a good mystery novel or solving the latest crossword, the needed ingredient is the wall mount swing-arm lamp. 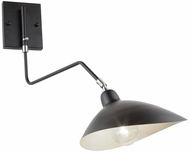 Plug-in wall lamps, such as swing-arm wall lamps, are absolutely ideal for bedroom lighting, and they are back in, pardon the pun, full swing. 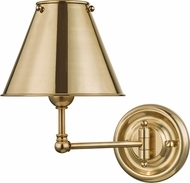 Through our plug-in wall lamp sale, you can buy swing-arm wall lamps at a great price and have discount wall lamps plug-in style or otherwise, delivered conveniently to your front door. 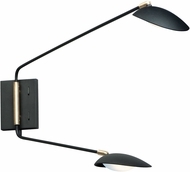 Swing-arm lighting, task lighting, and the best plug-in wall lamps are great for studies, dens, and the office. 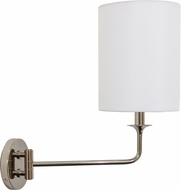 Swing-arm wall lamps are specifically designed for bedside task/reading purposes, and they are extremely versatile because of their swing-arm wall lamp design. 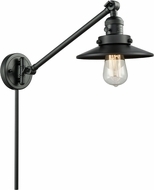 Simply mount the affordable swing-arm lamp of your choice and plug it in. 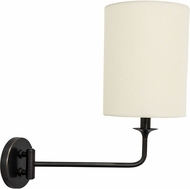 These inexpensive wall lights are easily moved to the spot where you need illumination, and as far as the different types of wall lamps, plug-in lights are simple to use. 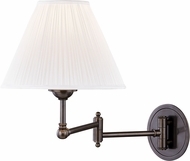 Every plug-in wall lamp is easy to mount, and each is part of a category of quality wall lights. 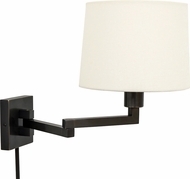 * Most swing-arm lamps may be hard-wired and or may be plug-in wall lamps that include a cord, plug, and cord cover. 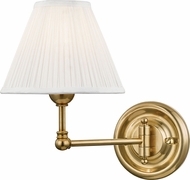 Please read the details on each swing-arm wall lamp model for further info. 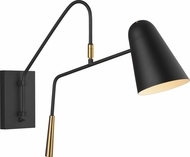 That way, you will get the right affordable swing-arm lamp that you need, whether or not it is a plug-in wall lamp. 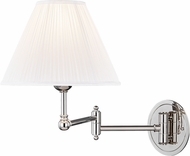 If plug-in is the style of wall lamps that you are looking for, plug-in should appear in the item's name or description. 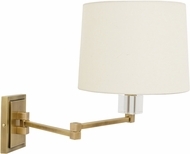 Swing-arm wall lamps are the perfect answer to all your bedside task lighting needs. 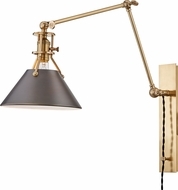 Available in a practically infinite number of shapes, sizes, and styles, a wall-mounted reading lamp can fit with any living or bedroom décor and is extremely versatile when it comes to installation and ease of use. 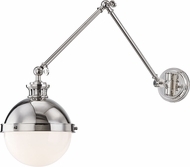 While there is certainly a need for overhead ceiling lights or even floor lamps, nothing can compare with the convenience and intimate space created by swing-arm lighting, including the best wall-mounted reading lamps. 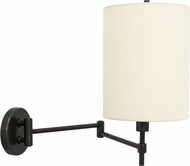 A subcategory of wall sconces, wall swing-arm lamps come in a variety of designs ranging from the unusually traditional or rustic lighting to minimalist, contemporary lighting elegance. 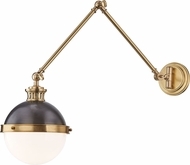 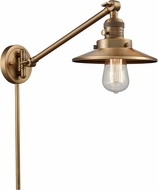 While all wall mount swing-arm lamps have one thing in common—they swivel around to direct light wherever you need it most, you can find a swing-arm light made in any motif imaginable—from tropical wall lighting to candle wall sconces to wrought iron lighting—the choice is as expansive as your imagination. 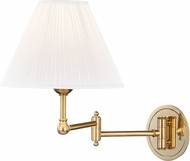 You can always buy affordable swing-arm wall lamps and other quality wall-mounted reading lamps when you order from Affordable Lamps. 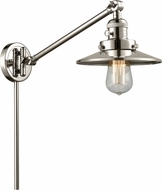 Though one usually finds a swing-arm task light in the bedroom for late night reading, swing-arm wall lamps would also be useful in a living room next to a couch or armchair, or in an office above a desk or near a bookshelf. 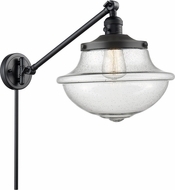 Just consider where you might need more light for reading, knitting, writing, woodworking, solving crosswords or even just cuddling and install a convenient plug-in sconce to create a source of illumination that is extremely flexible and handy. 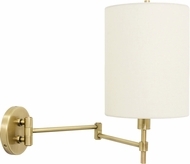 While perhaps they are not as extravagant as some other light fixtures, swing-arm lamps can be much easier to install and control than pendant lights or chandelier lighting and make turning off the light without getting up a snap. 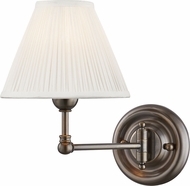 That is why when it comes to discount wall lamps, plug-in style lamps are often preferred. 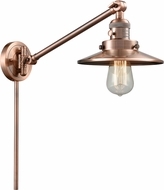 And of course the swing-arm lamp is not to be left out of the energy efficient lighting category, because these modern lighting innovations should certainly be part of the movement to “go green” and make your home a little bit more sustainable. 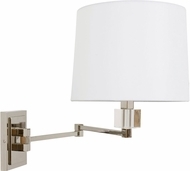 Consider purchasing a much longer-lasting fixture like a fluorescent or LED light—the extra investment in your energy saving bedroom swing-arm lamps will certainly pay off. 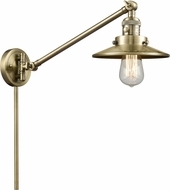 Your electricity bill will be much lower than with traditional incandescent fixtures and your wall-mounted reading lamp will last ten times longer, providing hours of soft light until you’re reading to roll over and drift off to dream land. Save energy and the environment with discount swing-arm lamps and other wall-mounted reading lamps.